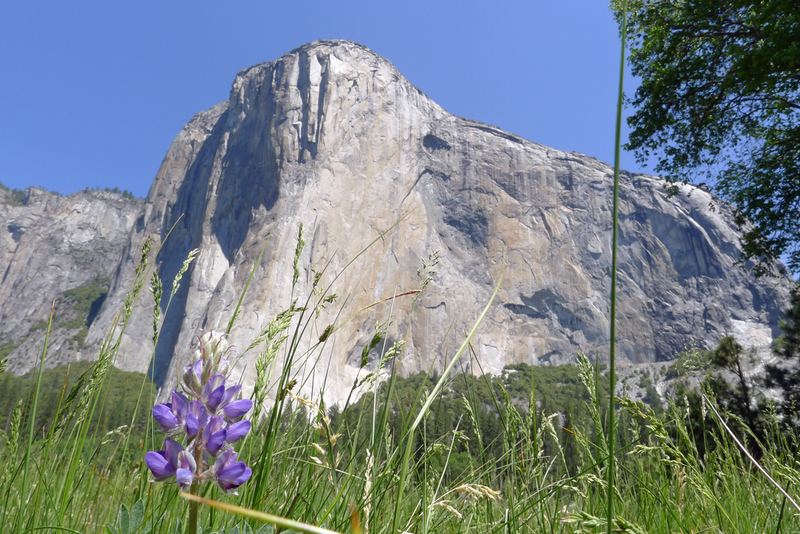 If you're a rock climber Yosemite Valley needs no introduction. There's not a lot I can say about the place that hasn't already been said by others. Each trip I've taken there has been spectacular and different. In a way, it's possible to track one's progress as a climber by the routes they climb during their trips to the valley. For me, early trips involved cragging and shorter multipitch routes. I gained knowledge of the rock, the formations, and the routes I wanted to climb on later trips. Later trips have involved day ascents of bigger features and a few multi-day big walls. My last trip there, six years ago, was an amazing five week odyssey with my very close friend Lawrence Haas. 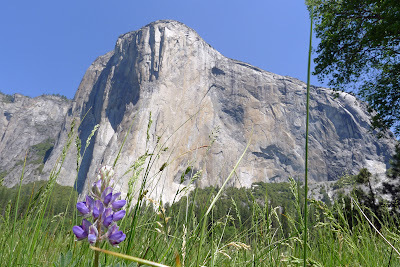 We climbed routes on many of the major formations, including the Salathe Wall on El Capitan, the West Face of Leaning Tower, Steck-Salathe on the Sentinel, North Buttress of Middle Cathedral, South Face of Washington Column, and did many days of cragging. 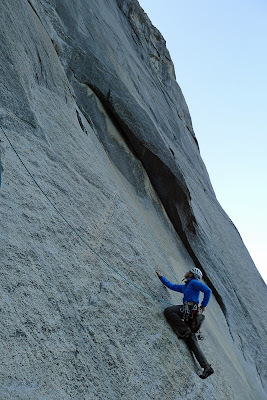 It's hard to beat a trip like this – there's plenty of time to get used to the variable friction of valley granite and gain the burly strength requisite for many of the sustained cruxes. Six years is a long time, and I was due for another pilgrimage to the Valley. Last winter, another one of my long-time climbing partners, Erik Eisele, approached me about going to the Valley in May. I said yes before contemplating dates, asking my employer for time off or seeing if my partner minded keeping an eye on our dog by herself. I guess this was irresponsible of me, but who wants to pass up a trip to Yosemite with a great climbing partner? Erik and I planned a short trip - ten days with travel time. When you figure in travel, scouting objectives, and planning this doesn't leave too much time for climbing and resting or any room for errors on big routes. One large low pressure system or any small setback can shut the entire trip down. As the trip approached we worked out the travel and gear arrangements via email and phone. Flying from Manchester, which is centrally located between us, ensured that we'd both make or miss flights together. Neither of us would be stranded while the other one waited for their partner to arrive. All our travel plans managed to work out exactly as planned, and on May 18 we arrived in Yosemite around noon. By 3 p.m.we were on the low-angle initial pitches of the Nose (of El Capitan), struggling with strong winds and slabby, strenuous hauling. By 7 p.m. we were rappelling down fixed lines, away from our haul bag anchored at Sickle Ledge, to spend a quiet night on the ground. Pizza at Curry Village satiated our hunger. Malted hops and barley relieved any social anxieties I'd developed ages ago. Erik doesn't worry about those same social anxieties. He's a high-speed, sarcastic and edgy northeastern journalist who prefers evenings without alcohol and mornings without caffeine. We retired for an early night with friends in Y.O.S.A.R. camp, anticipating an early start the following morning. The predawn hours came too soon for us and before long we were jugging fixed lines to Sickle Ledge, climbing stout valley crack pitches and struggling with a haul bag through fourth and easy fifth class terrain. The Stovelegs, which comprise only an eighth of the Nose route on El Cap, occupied much of our day. Several pendulums, poor belay stances, and low angle hauling with full haulbags make the Stovelegs one of the most challenging sections for big wall climbers. It's here that Erik and I began to see the challenge of the Nose as a wall, and the merits of the Nose as a single day ascent. The Stovelegs, which are mostly 5.8-5.9 handcracks, are as good as crack pitches get. However, rope drag and a heavy haul line change one's perspective of stuffer 5.9 handcracks. During a single push ascent, without a haulbag, it's possible to traverse for an entire pitch, all the way to the base of the best Stoveleg crack. From there one can practically climb to Dolt Tower in two spectacular 5.9 pitches. Beyond the Stovelegs lie Dolt Tower and El Cap Tower. The latter was our bivy site, and is easily the single best bivy spot on the Nose. As Erik and I munched on salami and cream cheese tortillas, our supper for the evening, a party blazed past us. They'd started the Nose at 6 p.m., and by 9 p.m. were next to us atop pitch 15. Salami and cheese could wait. I wanted to see what these boys were doing to climb so quickly. The leader of this other party was using a technique called "shortfixing", where he pulls up and fixes the rope where it becomes taught to his partner, only to begin climbing again immediately. The second can then ascend the rope below while the leader climbs above. The night before we'd learned about the key to climbing walls fast - the P.D.L. (Pakistani Death Loop). These guys gave us a great example of how a party can climb fast and take big risks using the PDL. 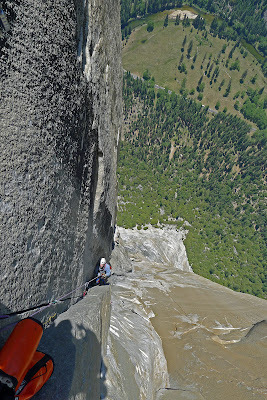 The leader was soloing everything up to 5.9 with a 100' loop of slack piled on the ledge below. An hour later they were gone, through the King Swing an on toward the Great Roof. We found out from another party that they'd already climbed the Salathe Wall earlier in the day. Mutants. Rarely have eight pitches consumed me the way day two of our wall ascent did. The climbing from El Cap Tower to Camp Five, past the Boot Flake, through the King Swing, around the Great Roof and past the spectacular Pancake Flake was engaging and challenging. Before long it was dark, yet we still hadn't reached a bivy site. I groped and slapped my way to the sloping ledges of Camp Five just after sunset and hauled until the bags popped over the left end of the ledge. Honestly, I was hot and tired. I kept wondering why we'd bothered hauling this crappy PVC-fabric pig of a haulbag, full of food and water, up an amazingly beautiful sea of stone. Camp Five, according to Supertopo, was a good bivy for four, yet all I saw were sloping ledges that would uncomfortably sleep a single individual. 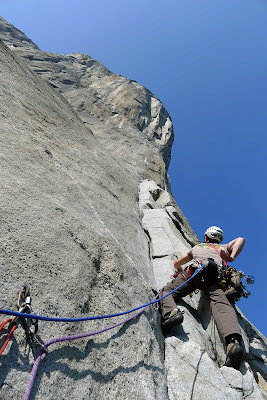 Ahwahnee Ledge (flat and square, halfway up the Leaning Tower), Dinner Ledge (an enormous terrace you can actually unrope on one third of the way up Washington Column), and the Alcove beside El Cap Spire (a flat bivy for 4-6 on the Salathe) are "good bivies". Camp IV, V and VI on the Nose are crappy. sloped, or small ledges. No amount of fatigue was going to make them look better for me and that's saying a lot because I was exhausted. Day 3 dawned clear and, once again, came too quickly. I'd been sliding toward the edge of the small sloping ledge all night long, and felt like I'd only received and hour or two of solid sleep. With swollen fingers and sore bodies we packed our bag and began aid climbing once again. A pitch later we were at the Changing Corners, and four more pitches found us one ropelength below the top, stuck behind a party we'd been catching up with throughout our climb. Erik sped through the final bolt ladder to the summit cone, and hauled the bags while I jugged. After a short repacking and snack session we were off toward the East Ledges descent route. The East Ledges are the fastest way off of El Capitan, and without a haulbag they're casual. You can practically run to the three fixed rappels and then run down the buffed dirt trail below. Toss a haulbag on your back and things look a bit different though. The pig threatens to tip you over, snags every tree branch overhead, and acts like a stiff during rappels. My quadriceps were screaming and I was soaked in sweat for the duration of the entire descent. I've heard it said that the best athletes are like animals - completely at rest until they need to move. They've even found that animals, and many of the best sprinters, are able to relax between their strides during a sprint. This became a theme for our trip. If we weren't on the go we did absolutely nothing. This idea of doing big days, followed by pronounced rest sessions feels challenging for me. I'm a bit of a busybody, but the rest felt good and was much needed. Two days later we left camp in the darkness, headed for the West Face of El Capitan. 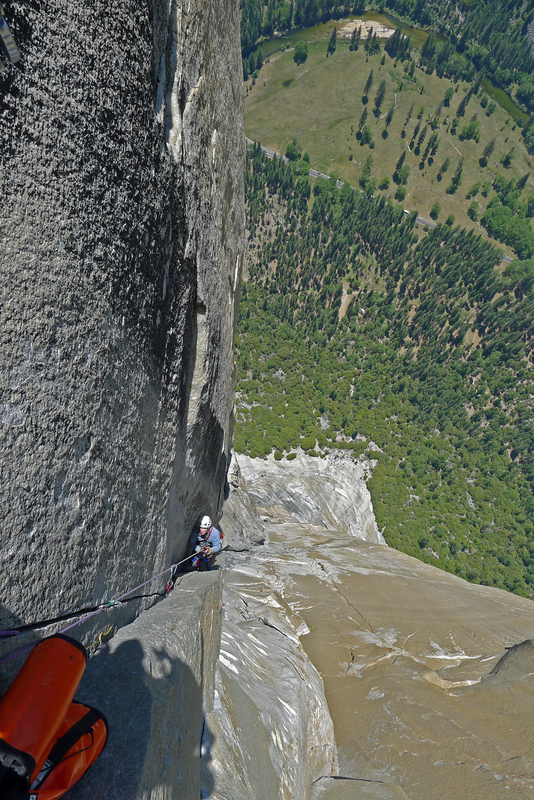 The West Face, an 18-pitch line up the far left side of El Cap, is reported to be the best route on the left side of the wall. It's also a moderate free climb which goes all free at 5.11c and can go as easily as 5.10c A1. The hardest pitches on the West Face are low on the route, and before long we were way off the ground with all the crux 5.11 pitches below us. I'm not going to lie, the abnormally slick, featured yet crack-free stone found in certain places on this route terrified me. The entire mid-section, where the route traverses down for an entire pitch of the climb, left me wondering why I choose to climb long routes at all. Two pitches later I was happy as a clam stuffing my mitts into classic fist and hand cracks. Go figure. After a snack, a pitch of 5.10d and the most sandbagged 5.7 pitch either of us had ever climbed we flopped onto a very sunny Thanksgiving Ledge. 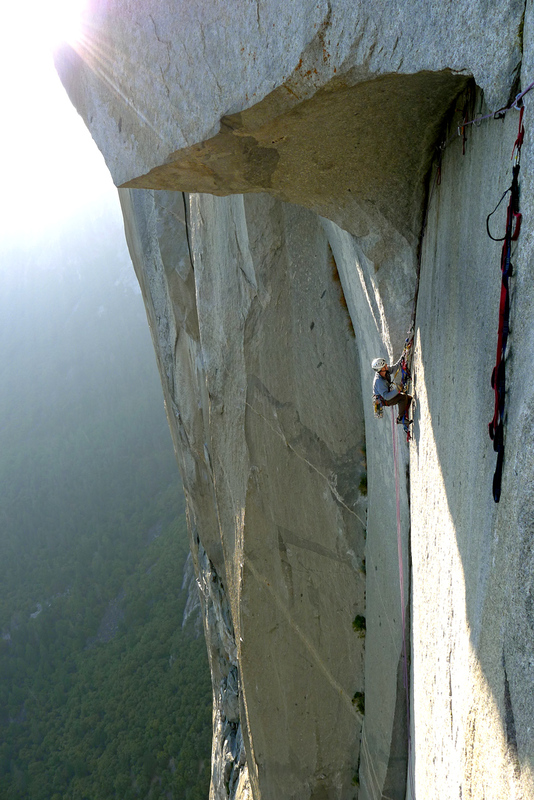 Thanksgiving Ledge bisects the entire west side of El Capitan, and generally marks the end of challenging climbing on all the routes it crosses. From here 600-800 feet of 4th-5th class simulclimbing leads almost straight to the summit of El Capitan. One more lap on the East Ledges, thankfully without haulbags, and we'd be eating pizza in Curry Village once more. At the rappels we passed two parties with haulbags, and within minutes we were back on the road. I couldn't help but think that single push big-wall efforts, even if they take more than 24-hours, might be more efficient than hauling a giant pig up with you. The following day rain and snow blanketed the valley. We had timed our final rest day perfectly. A visit to the Jailhouse, a spectacular sport climbing area in Sonora County, completed our trip and left us wanting more time for climbing. It's been four days now since I've returned home. My normal daily routine has resumed and it feels almost like I never left.. A friend pointed out that it might be interesting to look at my trip in the context of "flow", a mental state that occurs during periods of intense focus. The more I look back at the experience, the more it feels foreign and out of body. It's almost as if the burning, singular focus necessary for climbing big objectives is so great that very little processing can take place during the activity. One thing is for certain though. Climbing big walls in a day is doable, even for "mortal" climbers, and might be preferable to the classic wall style where one hauls a bag of camping gear, food and water with them. 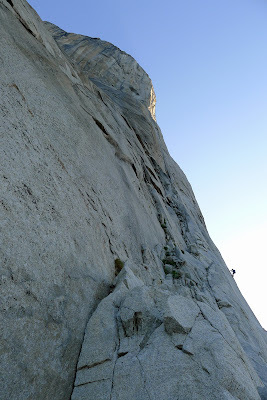 My next trip to the valley will most likely involve day ascents of wall routes like the Nose, Lurking Fear, and the Regular Northwest Face of Half Dome.